Fortnite’s account merging tool has finally landed for players with multiple accounts after a lengthy delay. You can use it to combine two accounts into one, merging your cosmetics, V-Bucks, and progress — but you’ll have to wait two weeks for the process to be completed. Many Fortnite players were forced to create a second account last year when the game landed on Nintendo Switch. Thanks to Sony’s initial, stupid stance on cross-play, those who had previously logged in on a PlayStation 4 were blocked from using the same account on Nintendo’s console. Fortunately, that’s all changed now. Sony finally recognized its decision was ridiculous, and now cross-play between all consoles, PCs, and mobile devices is possible. You can also use the same Epic account you’ve used on PlayStation 4 anywhere. So, many of us have a second account we don’t use anymore. We’ve made progress on it, purchased cosmetics with it, and have left over V-Bucks that are sat doing nothing on it. Its new tool lets you merge both your Fortnite accounts into one. You select a primary account, and all your progress, purchases, and V-Bucks get transferred over to it. Your secondary account is disabled, but you can use the login credentials for either account to access your primary account. There are some catches and caveats, however. Firstly, to be eligible for account merging, you must have played Fortnite on Xbox One or Switch with one of your accounts, and on PlayStation 4 with the other, before September 28, 2018. If you have two accounts that have only ever been used to play on Xbox, Nintendo Switch, PC, or mobile, you can’t merge them. You can’t merge accounts that are currently banned or disabled, either. Save the World llamas, defenders, heroes, schematics, survivors, XP, evolution, and perk materials will merge — but progress will not. Unreal Marketplace items and Creative islands won’t be transferred, either. Once you’ve used the merge tool, your secondary account will be disabled instantly, but you’ll still be able to use its login credentials to access your primary account. The process of merging all your content and V-Bucks takes two weeks. You’ll see a countdown timer in-game that shows you how long you have left to wait. 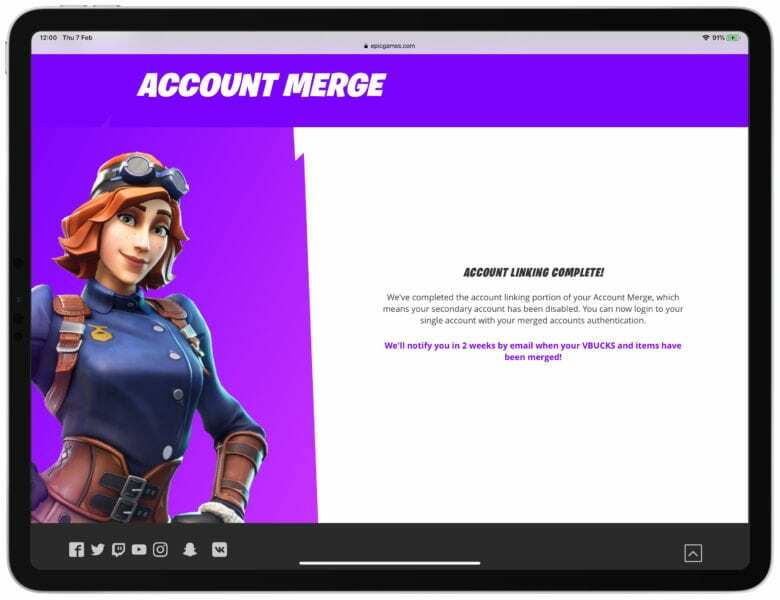 You can access the merge tool through Epic’s website today. Be aware that you’ll need access to the email addresses used for both accounts — and obviously the login credentials, too.